Having missed the trip to Mondello Park in late June, Snetterton on July 15-16 saw a first outing for the red, white and blue Eclipse Moser since the event at Donington Park in May. It was certainly a successful trip to Norfolk, with two third places… but not altogether very satisfying. Improvements to the Mosler were focused on the front uprights, which hitherto have been standard Corvette parts. These haven’t really got enough ‘meat’ on them for racing use, and the rather narrow wheel bearing, plus a slight tendency to flex, mean that the drivers have always been coping with a degree of pad ‘knock-off’, which requires them to settle the front pads with a dab on the brakes, before every brake application. Testing st Snetterton on Friday should have seen the Mosler running in four, 45 minute sessions – with two drivers present. But as it turned out, it became two 45 minute sessions, and one driver. Lee Caroline was diagnosed with a bug, and Phil Keen would be taking on all the driving duties. Qualifying in the two sessions at lunchtime on Saturday went well though, Phil Keen second fastest in each session – just nine-thousandths behind the Panoz in the first session, and (a rather worrying) 1.7 seconds behind Tim Mullen in the Scuderia Ecosse Ferrari in the second. 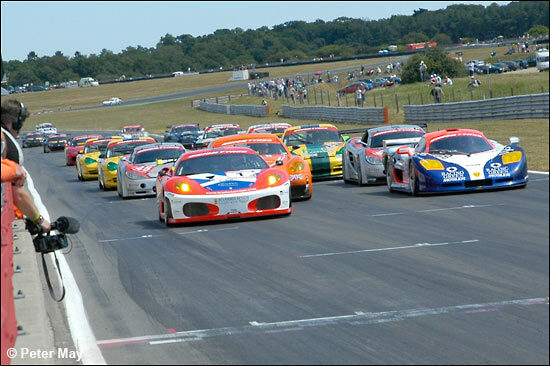 The Ferrari had some special tyres from Avon for this weekend – and the Panoz and the Eclipse Mosler didn’t. That set up some great competition between the two American cars, but the Ferrari was out of reach of both of them. A glimmer of hope appeared before the first of the two races, late on Saturday afternoon, when, with the schedule brought forward by a few minutes, the Ferrari wasn’t present to take up its grid slot, and had to start from the pit lane. In didn’t really make much difference, except that a fast car chasing through the whole field is always entertaining. 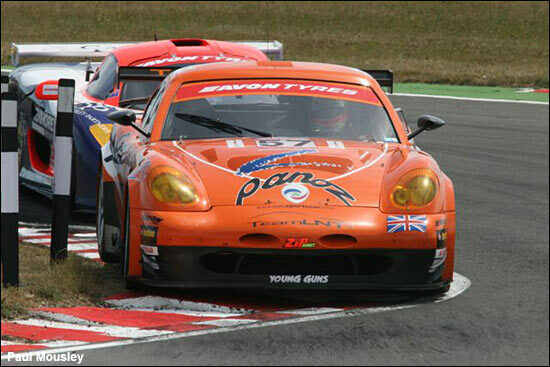 Phil Keen slotted into second from the lights, behind Tom Kimber-Smith in the Panoz – but didn’t complete the first lap on schedule. “I came out a lap down on the Panoz, and soon got past, but from a lap behind, the best we could hope for was third,” summed up Phil Keen. With just the one driver, there was also a 15 second penalty to add at the pit stop, so third place it was. 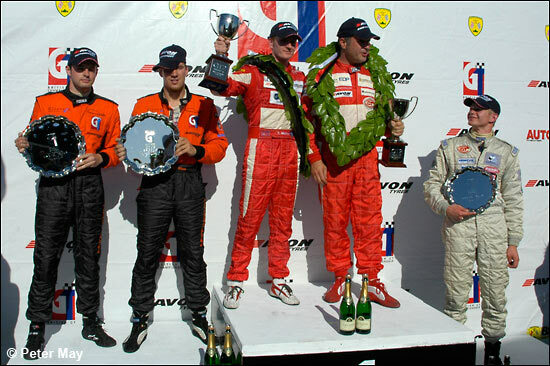 That was the third of the season, after two at the opening event at Oulton Park. 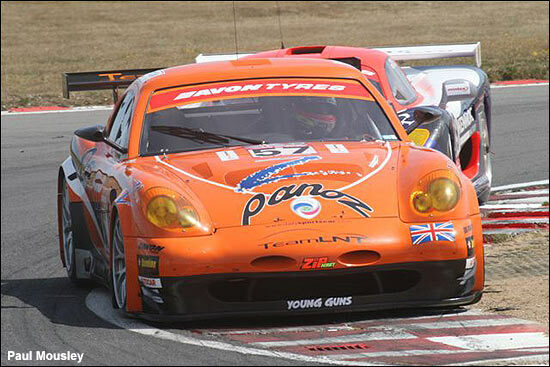 There was another to come on Sunday, but at least this time there was a very good race (with the Panoz) – for half of the event anyway. Phil Keen made a good start, but had Luke Hines pressuring him all the way round the first two laps. Unfortunately, with Tim Mullen starting the Ferrari, the 430 was more than two seconds ahead at the end of lap 1, and almost four ahead after two. 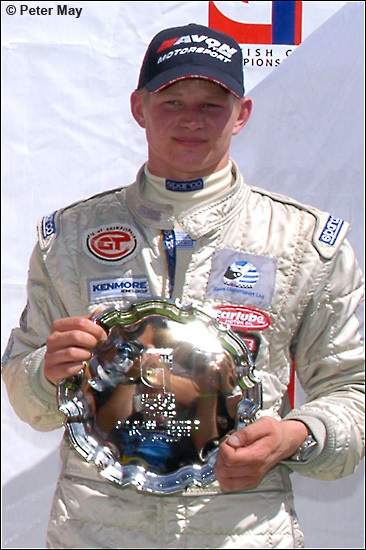 Luke Hines grabbed second place at the end of the back straight, under braking for the Esses, on lap three – but the next half an hour of the race had a distinct highlight, as the two GT2 cars raced nose to tail almost throughout. 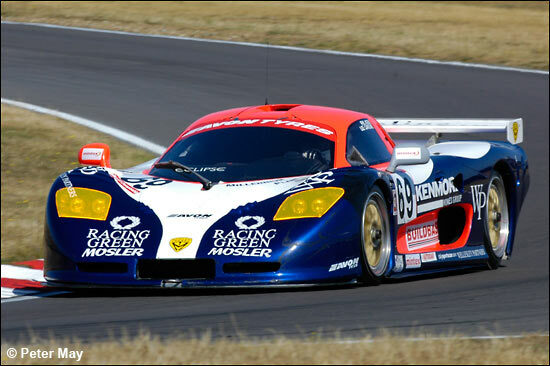 Here's Phil Keen and the Mosler almost hidden behind the Panoz - twice - into and through Russell. Phil Keen had to leave a slight gap, and move around to find some clear air, when the water temperature rose, to 97 degrees, in the ‘dirty’ air behind the Panoz, but typically these two circulated almost as one. Keen was the first of the three leaders to pit, on lap 26, by which time the Ferrari was almost 40 seconds ahead of the Panoz. 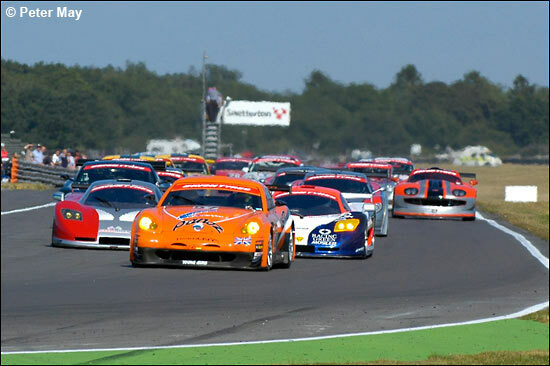 But that 15 second penalty (for having one driver) meant that Tom Kimber-Smith had a safe gap back to the Eclipse Mosler of nine seconds by the time both cars were up to speed, and although Phil Keen cut that to six by the flag, the Mosler was always destined for third place. With the Ferrari’s tyre advantage, even starting from the pit lane on Saturday didn’t disrupt the 1-2-3. 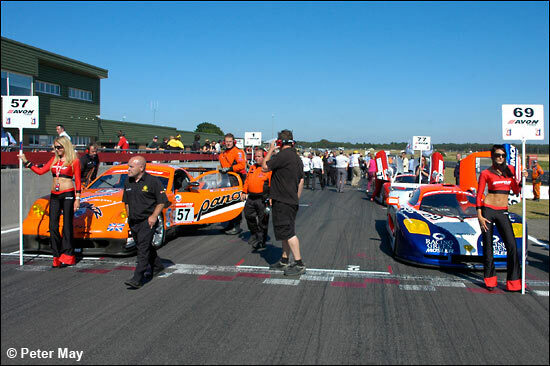 The next event is at Rockingham on August 12/13, by which time hopefully the leading GT2 cars will all have the benefit of Avon’s latest rubber.